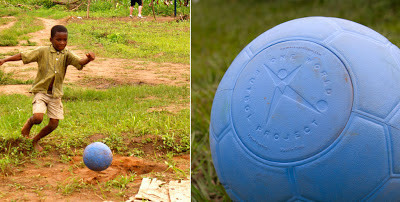 How do you take a mature and standardized first-world product - a soccer ball - and adapt it for the third world? The One World Futbol Project found that it takes a little rethinking: instead of a standard inflated ball that would quickly pop on a rocky makeshift soccer field, they designed a "virtually indestructible" solid foam ball that never needs a pump. The effort has all the other hallmarks of a good-for-everyone design: sustainability (the ball far outlasts normal ones, reducing waste), a buy-one-give-one program for first-world patrons, no child labor; heck, even Sting was involved. It's good to see that not all the design effort is being put into the newest state-of-the-art World Cup championship ball - good design can make more of a difference here than there.